Let your friends and family relax in comfort while enjoying cocktail and snacks on this Malibu Outdoor Patio 4-foot Wood Garden Bench with full-back, sounds perfect! Made from 100% Eucalyptus - a very durable Hardwood, this bench can stand up to all kinds of changes in the weather. The pores of the Eucalyptus is very dense; thereby it quickly repels water, and its natural oil combats and repels wood eating insects. Comes in the beautiful Natural Wood Finish, this will be a great addition to your outdoor patio! The perfect accessory for your Echo Garden bench is a cushion specifically made for it. This beautiful cushion is made from Sunbrella, the number one fabric for outdoor use. Sunbrella resists fading, and will not support mildew growth. Spot cleaning is easy with mild soap and water solution. For complete care and cleaning . You can choose from either macaw or pacific blue. Either one will freshen your outdoors! The lush tropical villas at a French Polynesian eco-resort inspired this contemporary 3 seat bench. Ideal for sipping cocktails at sunset, its ash grey finish, plush beige cushion and silver metal detail create its relaxed modern geometric style. This is a great addition to your home whether in the country side or busy city. Malibu Outdoor Patio 4-ft Wood Garden Bench Let your friends and family relax in comfort while enjoying cocktail and snacks on this Malibu Outdoor Patio 4-foot Wood Garden Bench with full-back, sounds perfect! Made from 100% Eucalyptus - a very durable Hardwood, this bench can stand up to all kinds of changes in the weather. The pores of the Eucalyptus is very dense; thereby it quickly repels water, and its natural oil combats and repels wood eating insects. Comes in the beautiful Natural Wood Finish, this will be a great addition to your outdoor patio! 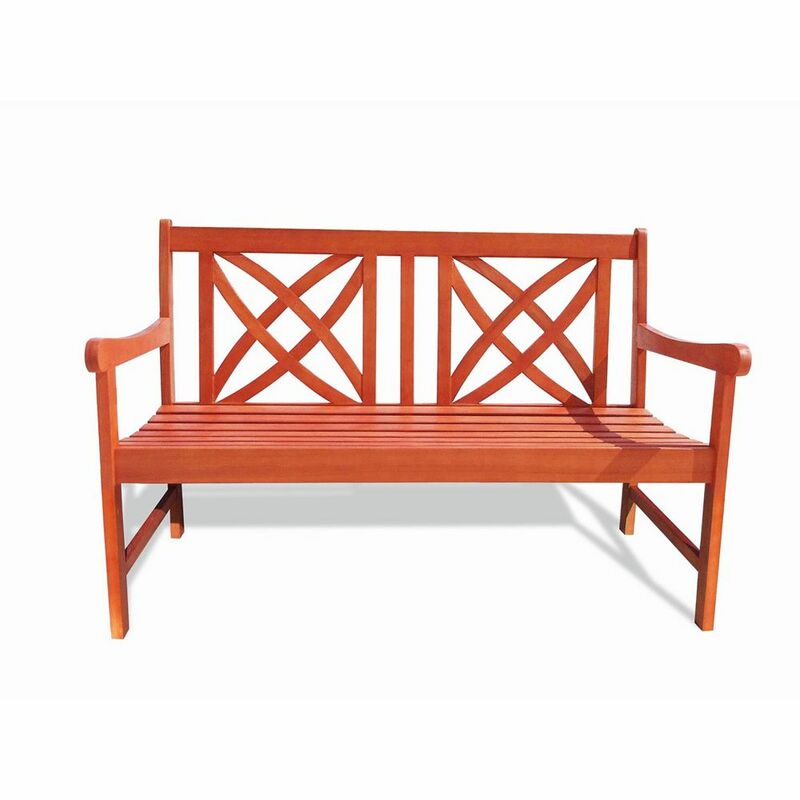 Malibu Outdoor Patio 4-ft Wood Garden Bench is rated 4.2 out of 5 by 10. Rated 5 out of 5 by Joseph from The bench is wonderful and arrived earlier than anticipated.Love it!... The bench is wonderful and arrived earlier than anticipated.Love it! Rated 5 out of 5 by Kristine from Easy to assemble. Great product. Great price.... Easy to assemble. Great product. Great price. Rated 5 out of 5 by James from Looks great in the garden!... Looks great in the garden! Rated 3 out of 5 by Sula from Aesthetically pleasing, but not very comfortable. I also had to... Aesthetically pleasing, but not very comfortable. I also had to drill holes to align the seat with the connecting spot. Finally, the front of the seat was not finished well and was slightly splintered. Once all that was fixed, the bench is now a pretty sight. Rated 5 out of 5 by Elizabeth from But it was larger than the space.... But it was larger than the space. Rated 4 out of 5 by Weekend from Very good price, spacious, easy to assemble. Very good price, spacious, easy to assemble.